The University of Nebraska Omaha (UNO) Service Learning Academy (SLA) works in collaboration with nonprofit community organizations, governmental agencies, and P-12 faculty. Reflection activities before, during, and after each project facilitate critical thinking and problem solving skills. The integration of academic knowledge with a service learning experience prepares students to work and serve in an increasingly diverse and challenging environment. This makes students more desirable for future employment and increases their sense of civic engagement. The SLA is housed in the Barbara Weitz Community Engagement Center (CEC). For students, choosing classes that contain a service learning component brings them out of the classroom and into the community. Every semester, there are a variety of courses at UNO that incorporate service learning. Students like you are given the opportunity to apply classroom curriculum to actual community needs. The opportunities provide a means of learning about the surrounding community and the organizations that serve those in need and take on important issues within the community. By doing your part, you will strengthen skills that will help you progress through your studies and/or career. 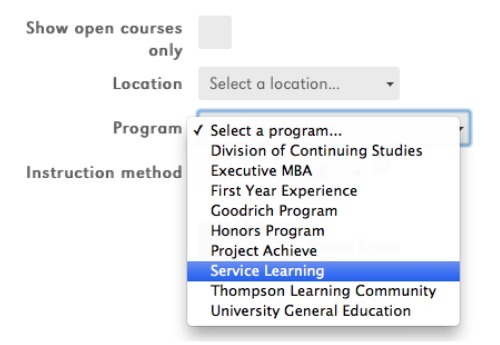 At the bottom of the page, click on the dropdown menu next to "Program" where it says "Select a program..."